Thanks to more than 6 years’ experience, Your Family in Madrid offers homestays in the center of the Spanish capital at the best price with the best host families, all selected with great care and tested periodically to match expectations from the most demanding customers. We know all the families that we work with perfectly, and maintain such a confident relationship with them that we guarantee that the profile of the families that we offer will correspond to what you need personally. In case you are not completely satisfied with the family selected for you, we are committed to finding another host family within seven days. We are on site and can be reached 24 hours a day if needed. Who are our host families? Our host families all live in the very center of Madrid, always close to public transportation (subway or bus) and in safe neighborhoods, so you can make the most of your stay to discover the charms of the Spanish capital without wasting time, whether your stay is purely touristic or related to studies or your professional life. Our families are usually composed of a couple with or without children, or of a single woman or man, all very available to welcome you and equally share a passion for hospitality, cultural exchange and their town! Your Family in Madrid also selects families based on the quality of the accommodation, ensuring your comfort during your stay. Your Family in Madrid adapts homestays in Madrid to all profiles: our clients are individuals or groups, students (underage or over 18 years old), professionals and even pensioners. 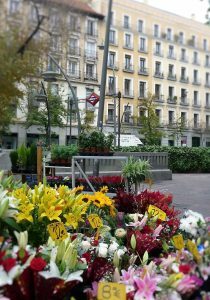 Why choosing a homestay in Madrid? Madrid, capital of Spain, with its 3 millions inhabitants (6.5 with te metroplitan area) is the ideal city for an authentic Spanish experience. Madrid attract millions of turists every year (5 millions in 2015, ranked the 6th European capital visited, first Spanish city before Barcelona) because of its cultural, gastronomic and leisure offer, huge and unique. It also offers a variety of activities and excursions, due to its geographic location: situated in a valley at an altitude of about 600 meters, Madrid is surrounded by mountains and nature protected areas (such as National Park of Guadarrama, only 50 kilometers from the capital). It is also historically the starting point of Spanish roads, and is perfectly communicated with the rest of the country, as well as most European cities. Madrid is the capital of the Castilian language, official and universally recognized, the reference for those who wish to learn Spanish, or develop their professional skills in a pure language environment.